The leading independent specialist for windscreen replacement and windscreen repair based in Glasgow and serving all of the Glasgow area. 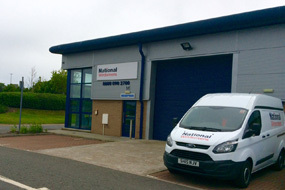 National Windscreens Glasgow fitting centre provides windscreen replacement and windscreen repair services to businesses and individuals throughout Glasgow and the Glasgow area. Andy Rae and the rest of the team offer you a very warm welcome to Glasgow windscreen fitting and repair centre, conveniently located near to the M8.Just a 10-minute walk from Easterhouse Railway Station. Shopping facilities are available nearby at The Fort Shopping Centre. Glasgow fitting centre is the largest fitting centre in Scotland with over 14 mobile fitting vehicles. Glasgow fitting centre also is the home base for Bus + Coach Department serving many large bus fleet operators including Megabus + Stagecoach. The contact centre in Glasgow receives calls from customers throughout Scotland. With completely tea + coffee facilities and comfortable waiting area the Glasgow fitting centre is a great place to wait while you vehicle is in for Repair. The Glasgow windscreen fitting centre and its mobile vehicle glass technicians service the needs of Glasgow and the surrounding area including Ayr, Kilmarnock, East Kilbride and Paisley. With 108 fitting centres and over 800 mobile technicians, National Windscreens operates the UK's largest windscreen repair and windscreen replacement network. The company provides low cost, high quality windscreen replacement and windscreen repair from its Glasgow fitting centre 24 hours a day, 7 days a week, 365 days a year. Repair and replacement of all types of vehicle glass including windscreens, rear windows and side windows is undertaken throughout Glasgow and all of the Glasgow area.